Carole and I took an extended trip to Canada’s Maritime provinces (well, all except Newfoundland) in 2003. For the most part, we had a good time, although the mosquitoes in coastal New Brunswick were something we could have easily done without. Cavendish is a waterfront community on the Gulf of St Lawrence. There’s a Canadian national park there with campgrounds and some surprisingly nice sandy beaches. You can visit the house where “Anne of Green Gables” lived — albeit in a notional sense, since Anne is a fictional character. You can eat lobster until you burst — every single church in the area runs a lobster supper in their fellowship hall. If you want, you can take home huge bags of potatoes; they raise a lot of potatoes in the area. But our overwhelming impression of Cavendish was that it was Canada’s answer to American tackiness. Imagine a hodgepodge of the worst American tourist dives you’ve ever seen — places whose sole purpose is to appeal to the part of the human brain that treasures cheap plastic souvenirs and t-shirts with lamely funny art and slogans — mixed in with Canadian politeness and wholesomeness. Evidently our neighbors in the Great White North had not wanted to be outdone when it came to letting stupid people behave stupidly. Every store advertised their “unique gifts”… all of which were exactly like the “unique gifts” sold at the store next door. We arrived in Cavendish on Canada Day (July 1), 2003. We put up our tent at the national park campground at Cavendish Beach and went looking for a place to eat. Rather than partake of one of the church suppers — Carole was doubtful about lobster cooked in a basement kitchen by some half-trained former lumberjack named Beau — we wound up at a sprawling local restaurant. I say “sprawling” because fully half of its footprint was dedicated to a sizeable gift shop that had everything you could possibly not need: day-glo flip-flops, shot glasses with double entrendres printed on the side, weird hats, weirder shirts, ashtrays made from large shells with patches of glitter and sand hastily glued down here and there. They were leaving no stone unturned; in fact, all the stones had been painted to look like frogs, with googly eyes attached. And lobster hats. 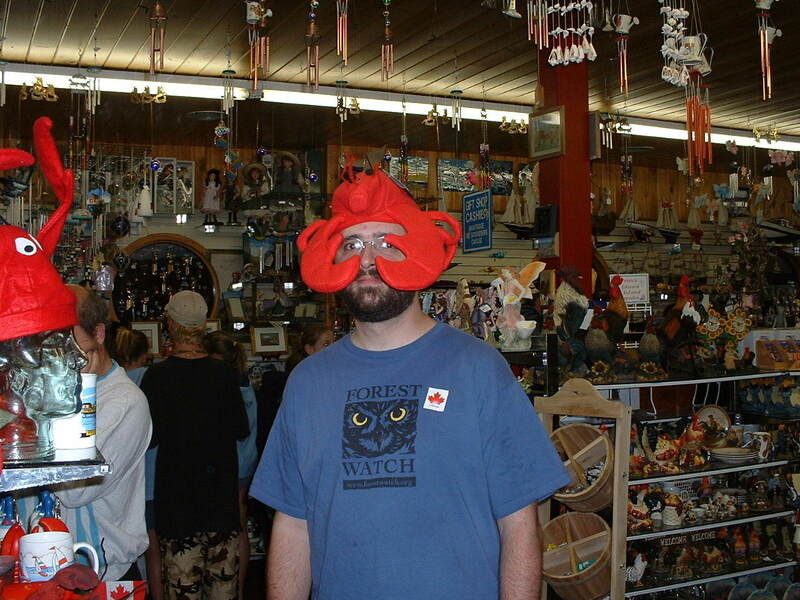 Did I mention the lobster hats? Carole dissolved in laughter. It was quite some time before she recovered enough to try to explain the joke to the perplexed shopkeepers. As it happens, they never did understand; they’d lived, surrounded by all that stuff, so long that it had become normal.